Fantastic project by Andrew Morrison who built this home in 4 months, which cost him $23,000 for the the build + $10,000 for all the appliances. The pictures above were taken from either end of the House. 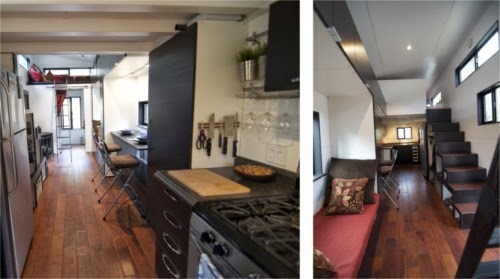 This project was set up for, off the grid living, down to the the fact that the house is built on wheels so that it can be taken to your preferred location. 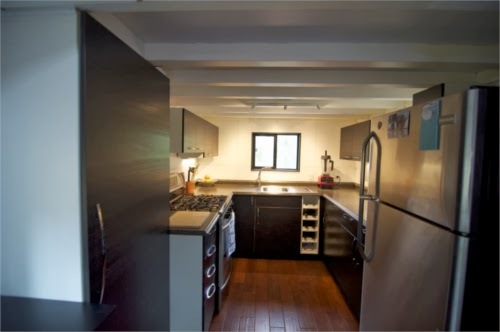 Unlike a lot of the small houses we have featured on this blog, this designer and builder has actually lived in his project. 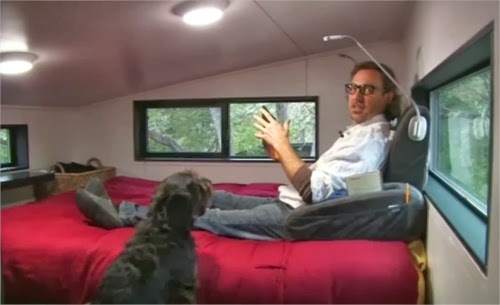 We have included a 30 minute video in the article, I know it might be a bit long for some, but it is narrated from the point of view of someone that has lived (with his wife Gabriella and their Tiny House dog Oscar) and knows every particular of the house he designed and built. 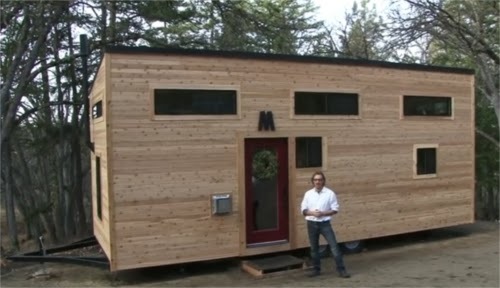 What do you think, could you live in a place like this over a long period? Put your answers in the comment section at the end. 1 Master Sleeping area, 1 Tv area / Guest Sleeping area, 1 full size Kitchen, 1 Office area / Dining area, 1 Composting WC and Shower. The house has loads of storage space, it is light and well ventilation, with a high end finish through out at a modest cost, what more can you ask for? Morrison and Oscar in the Bedroom.